For those of you thinking about visiting Caroline Bulmer Properties in Norfolk 2015 we thought it would be useful to give you a little bit of history about Brancaster and the surrounding area. Brancaster is a village and civil parish on the north coast of the English county of Norfolk. The civil parish of Brancaster comprises Brancaster itself, together with Brancaster Staithe and Burnham Deepdale. This destination is famous for wild birds, a sandy beach and a Roman Fort! It is the perfect holiday location for those with young children and those who enjoy the peace and tranquility of a seaside village. As one of the driest villages in the country, there is always something to enjoy outdoors. Watch the sky fill with pink-footed geese during winter. January and February are great months for fresh beach walks, May and June offer some of the best weather for sailing, kiting and sea kayaking. October and November are glorious wildlife months. Brancaster Beach comprises of miles of golden sand and endless views, perfect for summer walks, or for playing with children if you are visiting with your family. The beach area and some of the marshes are managed by the National Trust. The beach may also be used for windsurfing and kite karting within the permitted area. 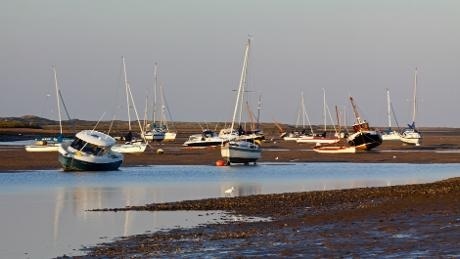 The Staithe offers a great place to start exploring the coast, if you’re sailing you can launch a boat, and sail in the sheltered water of Scolt Head Island; or if you venture a little further west along the Norfolk Coast Path you will find the well-known ancient Roman Fort of Branodunum. The beautiful views from Barrow Common are popular for both painting and photography, and many exhibitions and courses are run throughout the year. Enjoy the local hospitality and local seafood at The Jolly Sailors, The White Horse, Deepdale Cafe and The Crab Hut. We do hope you can experience the beauty of the Norfolk coast with us soon. © The Seed Group. All Rights Reserved.